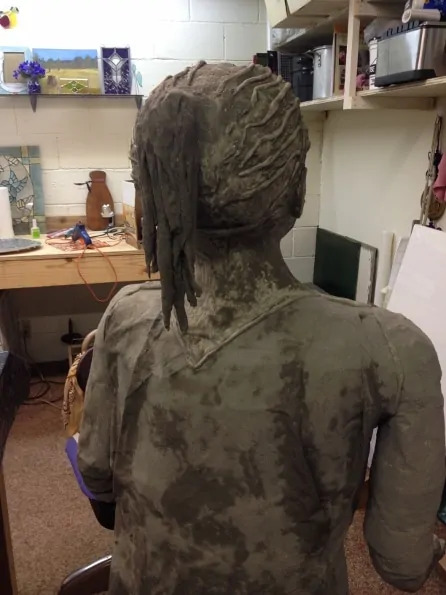 Today we have a guest post by Jackie Smith, who recently posted photos of her wonderful figure sculpture on the blog. She got tons of attention, and lots of people asked her questions about her process. She graciously agreed to write up a full post with all the details. Thanks, Jackie! 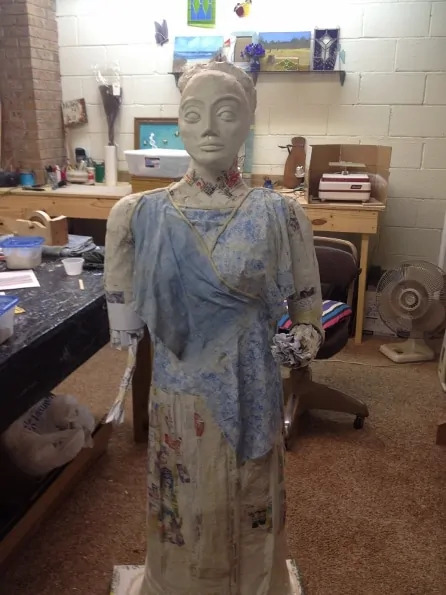 Several other Paper Mache sculptors have been asking how I made this figure and how she came to be. I call her “Goddess Charta”. 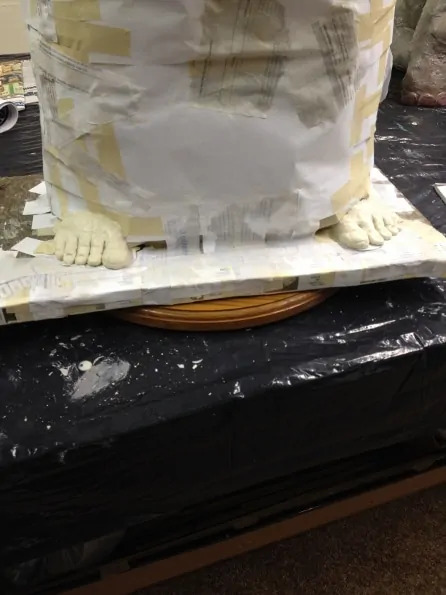 I am very new to paper mache and started with a frog that is probably about 20 inches tall. I looked back at the photos that I took of him and saw that I have only been making these fun projects since September of 2013. Yep…..a newby! 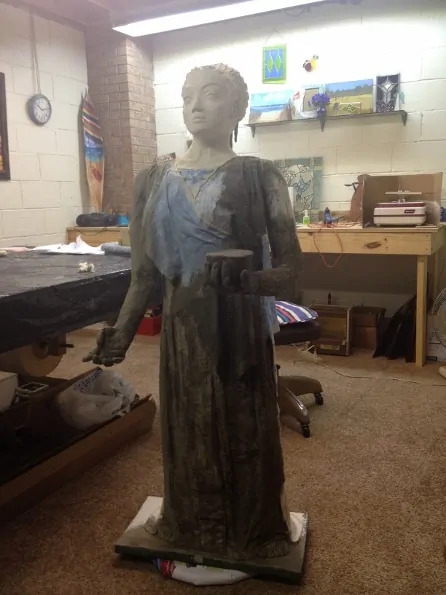 What made me decide to make her is that I wanted a large statue for my front yard. 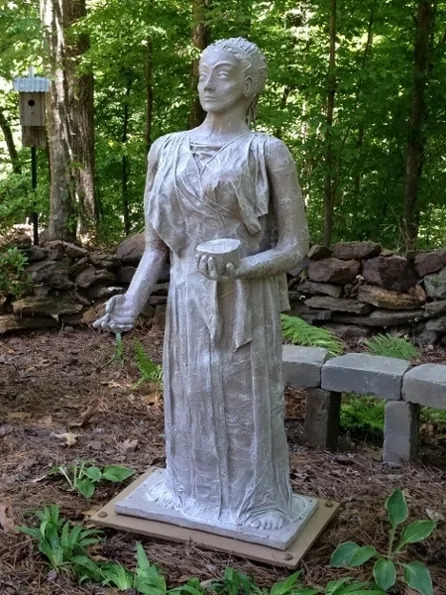 I could just see her in a large flower bed but when I started pricing concrete statues, the price made me start thinking about the possibility of making her myself. I didn’t know if I could accomplish any of this but just just dove right in and kept working on her until she was finally complete. First of all, before I ever started, I searched the internet for Greek and Roman Goddess’. Most of what I found, they were very masculine with helmets, shields and some had body armor which is not the look that I wanted. I found two that were suitable so I used them as a “go-by”. I used parts from the photos of each to build my Goddess. I spent a lot of time in my work area just sitting and starring at her and trying to figure out what is the next thing that has to be done. I made mental pictures of how I wanted her to look and using two photos as kind of a guide, I tried to do the easiest way possible. Another question was how did I get started making this Goddess. I began making her from her feet and upwards. I traced my own feet onto a sheet of paper, cut is out and taped to a wooden board. This showed me where to fill in with crumpled paper. I made her feet with crumpled paper except for the upper foot and toes. For that, I used the air dry clay. Next, I used cardboard oatmeal boxes for the legs. 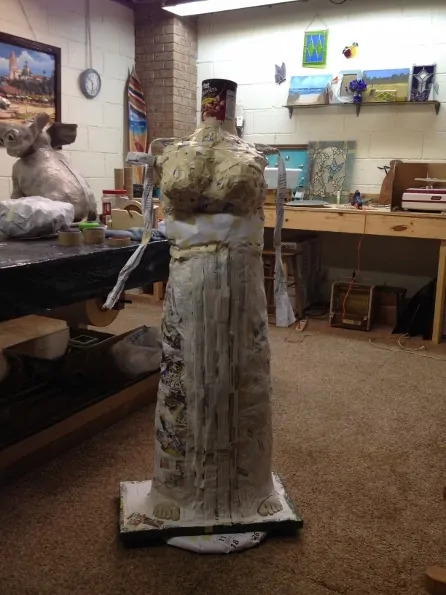 I used small boxes stuffed with paper to fill in between the legs and Wal-Mart plastic bags filled with paper to form her lower body and skirt. 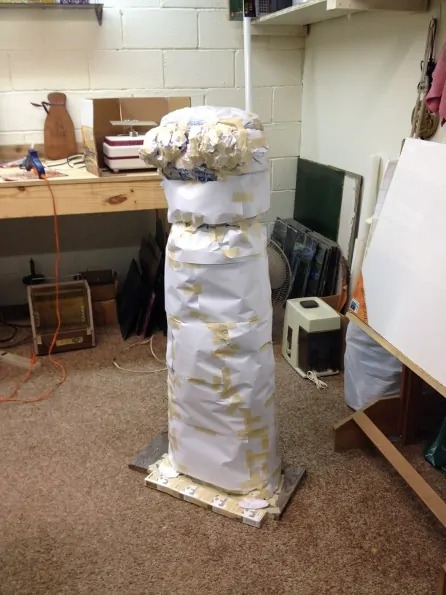 In order to form the skirt, I wrapped the the bag of the whole lower body with sheets of paper and taped everything really well with lots of masking tape. From there just kept working up the body. Her upper body and neck. I used a cardboard peanut can for her neck. She’s beginning to take shape now. The cardboard peanut can had to be cut down a good bit in order to get the right size. This is the $4.00 Styrofoam head that I found at a local store which turned out to be too small for the rest of her. The styrofoam head is just for filler so I built on top of the styrofoam. I used my husband’s tin snips to cut through the thicker cardboard peanut container. Regular scissors would not work very well. I also used paper strips with the flour and water to cover the styrofoam thinking that the clays would adhere better. I used the air dry clay on her face and some of her hair. This picture of part of her hair is crumpled paper and taped to the back of her head and covered with the paper mache clay. 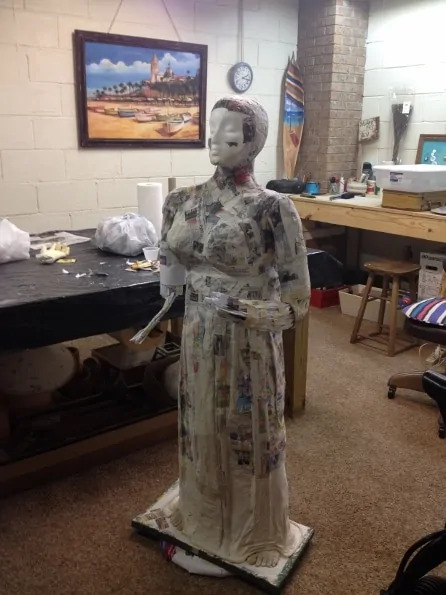 For her clothes, I used paper shop towels dipped in the flour and water mixture and then draped them on her while they were wet to form the right folds and lengths. Her arms are crumpled paper but I did put one strand of wire in her arms for more support. Her bowl is paper strips and flour and water to form it and then stuffed with more crumpled paper. I also closed the bowl because I didn’t want it to catch any rain. I have added the hair with air dry clay and reworked her eyes, mouth and nose several times until I was finally pleased with it. Boy, her expressions and features changed a bunch of times! haha I am finished building her now and covering her with the first coat of the “Thin Set”. When it dries, the color is much lighter. Also after it is dry, the outer coating is very stiff or firm. She has a ponytail which you really can’t see very well. I used crumpled paper to form a base for her strands of hair. I used strong paper towels dipped in the flour and water mixture and just twirled the strands and attached each one to the base. I used paper strips and the flour/water mixture to hold each one in place. This picture, i have already covered her with the thin set. Her ponytail took 2 or 3 days to completely dry and become stiff and rigid. She is completely covered with “thin set” which is a type of cement that they use to install ceramic tile floors. It’s like cement meaning it is a dry powder with sand in it. You just add water which I did to make it thin enough that I could use a paint brush and cover her with it. After the thin set dried, I used and exterior Latex paint on top of that in one color. I used a much lighter color to highlight the top layers and tried to leave some of the dark in the creases and fold over her whole body. With the lighter color, I used the dry brush technique. The final coat or several coats is with spar urathane. My local paint store said that the difference in polyurethane and Spar urethane is that polyurethane will eventually crack. So, she has three different products to seal her from the rain. Here is a closer picture. Just out of curiosity, I put her on the scales to see what she weighed. She weighs 22 pounds and is a little over 4.5 feet tall. Now that she is finished and in the garden, when I look at her, I am amazed that I built her. No forms and no help but me and her…got it all worked out and complete. When you decide to make something, just be sure to think through all the steps before you do anything. You can do this too if you only try!!! Waterproofing Paper Mache Clay – the Experiment Begins! Great website and congratulations on the inspiration and guidance you offer to others. I dabble in many art forms and recently a friend asked me to create a ‘Buddha’ type statue for his garden. Jackie Smith’s work his opened my creativity-vault. Really nice work there. paper mache. Both were indoors. One was completely devoured by ants. The other has stood the test of time. I painted it with oil based enamel paint. Is there anything that can be added to glue/paste to prevent insect damage? A lot of people have problems with tiny creatures getting into their paper mache. They go after the flour, I think, but some insects probably eat plain paper, too. I think the best option would be to skip the flour and water paste and use Elmer’s Art Paste instead. They use a more expensive variation of the product to restore valuable books, so it should hold up reasonably well for paper mache, too. One small box makes a lot of paste, and it seems to last forever. But you can’t use any form of paper mache outside unless you intend to encase it with some form of plastic. For outside work I suggest concrete or epoxy clay. 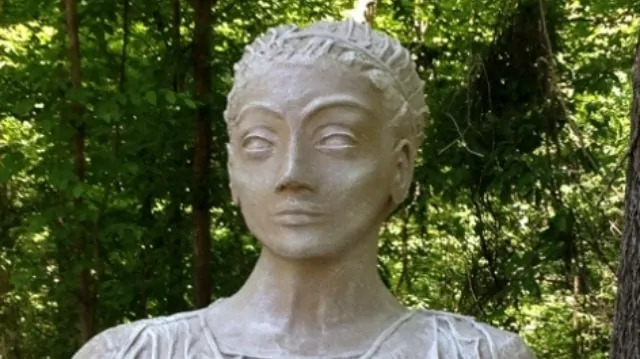 If interested, you can see how I made an outdoor sculpture with epoxy clay here. This was a fabulous post, she is beautiful. I am looking to do a figure, and wanted to know what you did for an armature? did you use wire? Thanks! Hi Sallyee. I’m not sure if Jackie is still watching the comments on her post, but we’ll keep our fingers crossed. It is a nice sculpture, isn’t it? Fantastic statue and very clever. I came across your post when I too was frustrated by the price of statues & being quite artistic myself I wondered if there was a way of making my own. You have inspired me. Hi Linda. If you make an outdoor sculpture of your own, I hope you’ll come back to this site and show it off. I am wondering how the sculpture has stood the test of time and weather? Hi Dan. We haven’t heard from Jackie for awhile. You might want to see this comment that she left previously. very nice work my dear! and informative too! keep up the creativity and great work. Inspiring. Jackie, I am just checking on how the goddess faired so far. Is she still holding up from the weather? Thanks for yourgenerous instructions. One question: How do you apply the thinset to the detailed areas? Is it thin enough to use a brush or do you just model it in there with whatever is handy? Wow Your garden statue is amazing I am so tempted to try would love to have something like that to nestle between my flowerbeds. I have not long finished a baby elephant and want to try a giraffe. Would love to see more of your work . Thank you Jessie!! Good luck with your giraffe. I made a baby elephant before Charta. I named her Ellie and she is posted somewhere on Jonni’s website too. 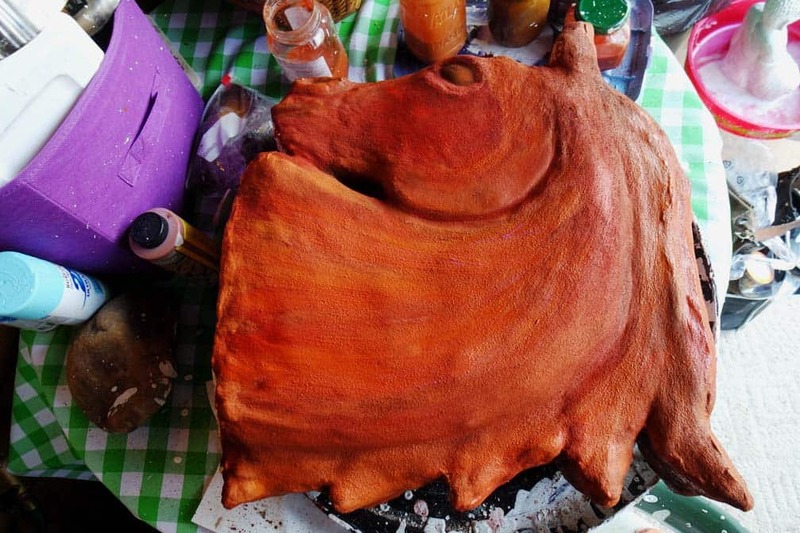 After making Charta, i haven’t made any more paper mache items because I’ve been so busy with outdoor summer chores. So maybe this winter i can make something else. Just haven’t decided what to make yet. Jackie, your work is amazing. I was quite surprised to find you are from Grenada1 A few years back, I retired and moved from Vicksburg to Carrollton. I want to make Clara, the nutcracker, and eventually for xmas decorations. 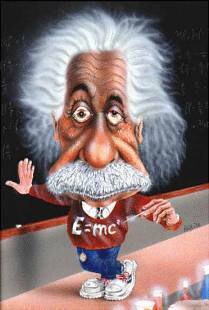 Big ideas, but little time! Will probably be at True Value this week! Keep giving info to us,as I am new at this. Hi Janis, I am very familiar with Vicksburg. You can email me at [email protected] and we can talk. i know some folks in Carrollton too. I wanted to mention a caution I learned from a friend who works with concrete. He said that it’s important to remember that all types of dry concrete set up with the addition of moisture–he stressed the word MOISTURE to make a point–he said that yes, water is moist, but so are our lungs. I had never thought about that. He cautioned me to ALWAYS wear a mask when handling dry concrete–even just handling the bags because if we breathe in the dust, that dust can get into our moist lungs, setting up and potentially causing damage. Also wear a good mask when spraying paints and varnishes. Good points, Barb. In fact, you should wear a mask when sanding, too. What a wonderful article you wrote! Not only did you provide great instructional details and photos, you also shared YOURSELF with us. When you spoke about your hesitations, the things you were unsure of, the things you tried then changed, you really touched my heart! It really encouraged me to stop holding back in fear of failure and to go forward in hope for success. Thank you so much for sharing! And I agree with you–Jonni is my mentor too! Even though I’ve never met her, she feels like a friend. Amazing! I have gleaned a lot from this that will help me with a project I am working on. Thank you for writing such detailed steps of your process, especially the armature. I have been totally over-thinking mine. I need to toss out this big piece of foam I have been fighting with and start crumpling some paper! Well Done!!! Thank you for sharing your work and how-to instructions. Have you done sculpture in other mediums? You appear to have an artistic ability that is more developed than an amateur. I look forward to seeing more of your work. You have also inspired me to get going and create for my gardens ( I am currently busy creating my gardens to put artwork in! 🙂 And thanks Jonni for this website! We newbies really appreciate your help in learning and growing!!! Thank you everybody!! I am just so humbled by all of your wonderful comments and compliments. You all have also inspired me to do more too. I just haven’t decided right now what I want to do next. 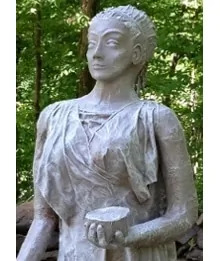 Rosalie, I have never done ANY sculpting before but wanted to try it many years ago. Just never did though. I too thank Jonni for this website too. If I had not found it, I know I would not have ever started working with paper mache. Thanks again!!!!!! And happy sculpting!!! Great job! I do have one question. Now that 5 months or so has gone by, how has she weathered the elements? I have heard that planting mint around areas where squirrels and mice like to be, helps drive them away. Maybe one or two small planters at her feet might help? I will have to try the Mint idea but need to put them in pots WITH bottoms in them. Mint can take over in a heart beat. Good Luck with your plans for yard art. I have a feeling that Jonni’s new cement formulas will be a much better product for outside artwork. I intend to use it next time. I love this statue of Jackie’s. I made a clay figure and now want to make one for outdoors. What are Jonni’s new cement formulas, please or where can I find them? I will put a photo of my sculpture on my Facebook page: Linda Carlson Art. Thanks, Linda. Hi Linda. I don’t know if Jackie is still watching this post, but I agree – this is a beautiful sculpture. You can find a link to the cement recipe I used to make a few outdoor sculptures on this page. They aren’t ‘my’ formulas, though, because I’m really not an expert in cement sculpting. 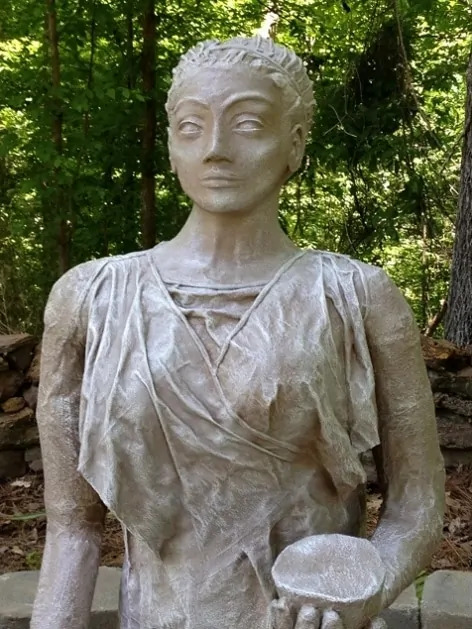 In fact, I’ve moved to using Apoxie Sculpt for outdoor sculptures simply because I can’t lift the 90 pound bags of Portland Cement. It would be expensive to make a sculpture as big as Jackie’s, though, if you used epoxy clay.